There are many free wood working plans for patio furniture on the Internet. Whether you're looking for a simple weekend project or detailed plans for a wooden table that will seat a crowd, you'll find projects for all skill levels. If you are going to take the time and expend the effort to build a piece of furniture for your patio, make sure to use materials that will help your project look good and last for years. When selecting a wood for your project, use some caution. Pressure treated wood, particularly older wood you may have salvaged from other building projects, may contain chromated copper arsenate (CCA). CCA has been widely used to treat wood, particularly pine, for outdoor applications in the U.S., but recent evidence suggests that the chromium and arsenic in CCA can leach out, causing environmental hazards and health problems for people coming into close contact with it. Even though CCA treated wood has been around since the 1940s, and was even used in outdoor playground equipment at one time, it is not safe for residential applications and should not be used to make outdoor furniture. Although you should always verify your suspicions, you can sometimes identify CCA treated wood by its greenish appearance. There are a lot options for finishing your outdoor furniture. Personal preference and practicality play a big part in deciding on the right look for you. You may be a naturalist at heart and enjoy the appearance of gently weathered wood that turns a soft gray over time. High-quality, older woods have a dense, fine-grained texture that helps protect them from damaging moisture and sun exposure. If you like the look of weathering, choose a quality wood that will stand the test of time...and the elements. 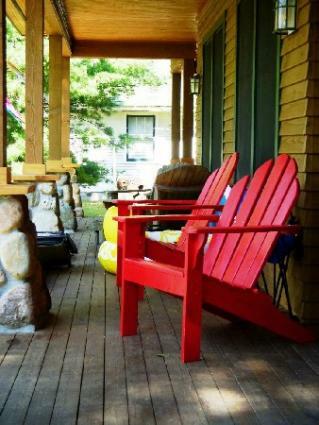 If you prefer your outdoor furniture with a bit of a sheen, some color, or that ever-new look, you can always treat your project with a protective stain or paint it. When evaluating finishing products, look for formulations designed for outdoor use that contain mold inhibitors and ultra violet (UV) protection. Keep your furniture in good condition by bringing it indoors or covering it at the end of the summer season if you live in an area that experiences a freezing winter. Keep your furniture clean by washing it regularly with a dedicated wood cleaner. The following list of sites for free wood working plans for patio furniture isn't exhaustive, but it will get you started. Most of the directions are pretty straightforward and many can be modified easily to suit your specific needs. After a hard day in your workshop, just set that newly finished lounger or chair on the patio and order up an iced tea.